Most yachts have just one mast even the larger ones, a few are schooner, ketch or yawl rigged. A divided sail area is more easily handled by a small crew but less efficient than a single area. A yawl or ketch may have an advantage sailing on a reach but not upwind or downwind. Also the cruising clutter such as solar panels, wind generator, or dinghy over aft deck and a wind vane at the stern does not take friendly to a sail aft. 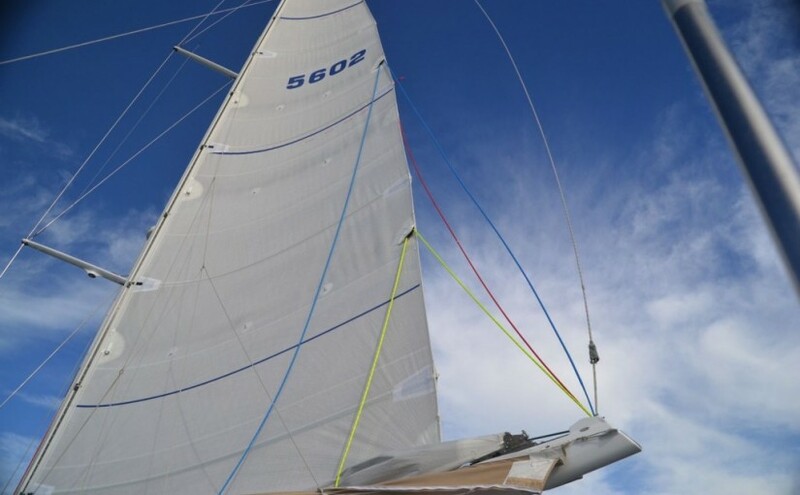 A cutter rig or a sloop rig with two headsails is a most versatile configuration for yachts. 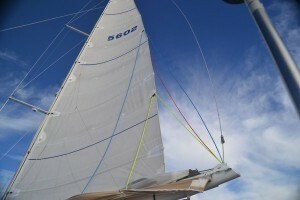 One simply rolls up the big genoa with increasing winds and changes to the smaller and heavier inner fore sail. On the negative side one finds that tacking sometimes requires rolling up the big genoa. This yacht under one reef has 3 more reefs to go. The blue line is the fourth reefing line. Almost all headsails are furled these days and more and more mainsails are now either of the in-mast furling type or the in-boom furling type although the majority of the smaller yachts still carry a fully battened mainsail equipped with 3 reefs. To avoid having to rig a try-sail in severe conditions one may consider adding a fourth reef which replaces a potentially difficult to handle try-sail especially for a small crew. One rigs the fourth reefing line only for long passages. Make sure the sailmaker makes the 4th reefing points very strong. Most yachts go round the Pacific or indeed round the world more or less successfully. Nevertheless there are certain aspects that are important for stress free cruising and comfortable passage making. The most important ones are safety, protection and the right equipment which will be discussed in the next chapters.